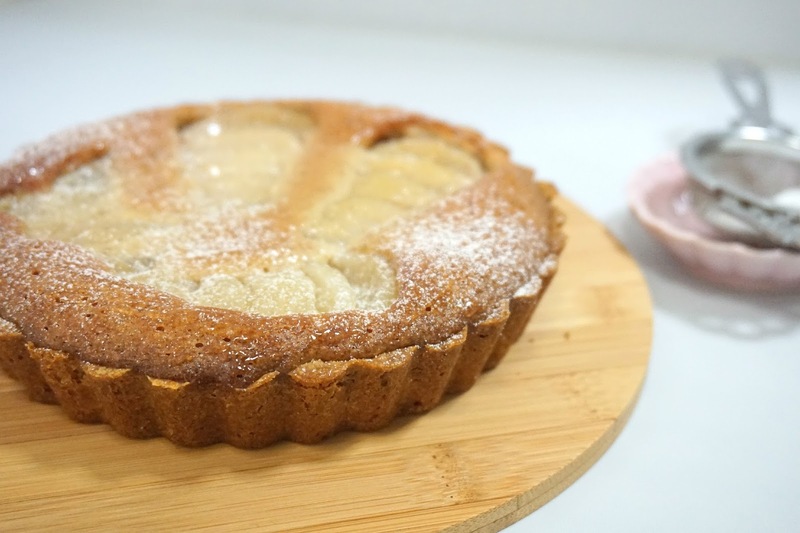 One of my fav desserts is the frangipane tart. Whenever it is paired with Pears, I get super delighted. 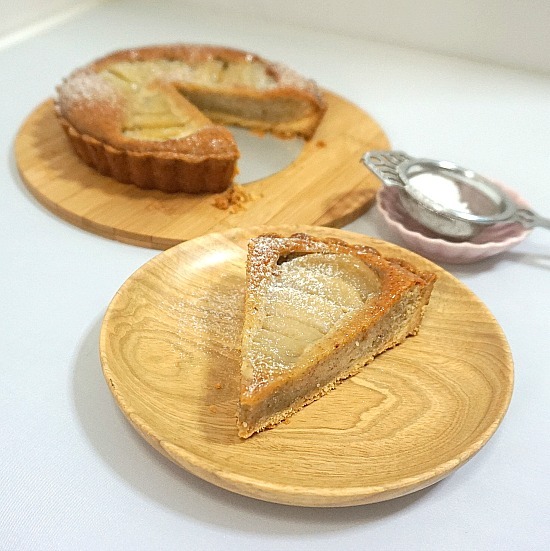 Frangipane is a filling made from almonds and it’s usually used in the same way as a custard just that it is baked together with the tart unlike the latter. For this recipe, I decided to pair it with some cinnamon poached pears. When it comes out hot from the oven, I glazed it with a little apricot gel for shine. You can enjoy it with a sprinkle of icing sugar or with your favourite ice cream. 1) Combine the water, sugar, cinnamon stick, vanilla, and salt in a saucepan large enough to hold all the pears and bring to a simmer over medium-high heat. 2) Cut the pears in half, remove the seed core then peel the pears. 3) Add the pear halves to the simmering syrup and reduce heat to low. Cover, and let pears poach for about 15 minutes, turning them halfway. The pears will become slightly translucent, very tender, and easily pierced with a knife. 4) Let the pears cool until room temperature before using. Drain pears on kitchen towel to remove excess liquid. 1) Put the flour, confectioner’s sugar, and salt in a food processor and pulse a few times to combine. 2) Add the pieces of cold butter and pulse until the butter is like pea size. 3) Add the egg yolk and combine in several pulses Do not overwork the dough. 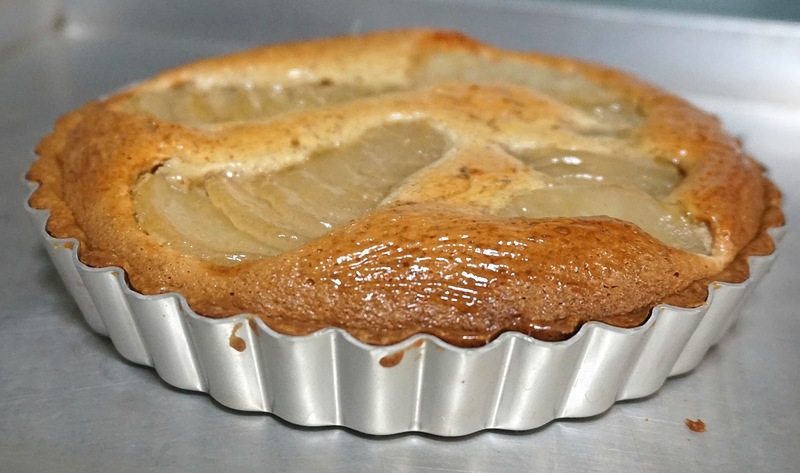 4) Butter a 6-in tart tin with removable bottom. Turn the dough out into the tin and press into the bottom and up the sides with your fingers. 5) Freeze the tart shell for at least 30 minutes. When you are ready to bake it, preheat the oven to 375 degrees. 6) To partially bake the tart shell, take a piece of foil and butter the shiny side, then press the buttered side tightly to the shell. You do not need pie weights. Place the tart shell on a baking sheet and bake for about 25 minutes, until the shell is dry and lightly colored. Let cool on a rack until room temperature. 1) Combine the butter and sugar in the food processor until smooth. 2) Add the ground almonds and blend together. 3) Add the flour and cornstarch, and then the egg and egg white. Process the mixture until it is very smooth. 4) Add in the vanilla and almond extracts just to blend. 2) Cut each pear half crosswise into 3/8 in thick slices. Press on the pear to fan the slices toward the top narrow end of the pear. 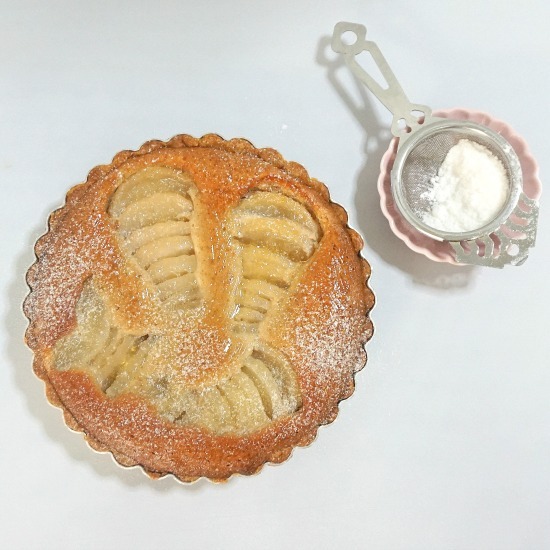 Slide the pear half onto the frangipane. Repeat with three other pear halves until there are four halves on the tart, evenly spaced. 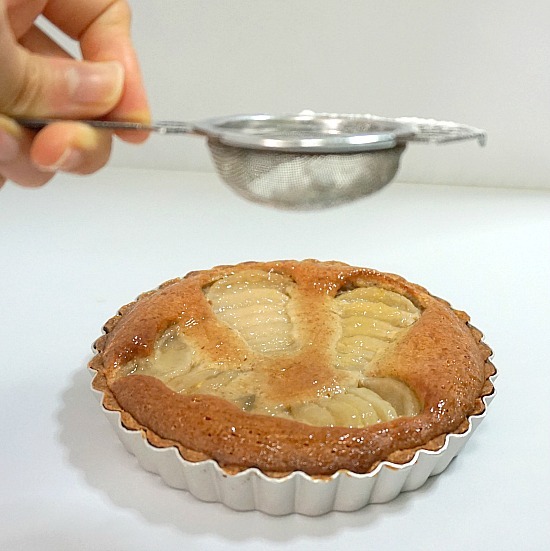 3) Place the tart on a baking sheet and bake in the oven for about 45-50 minutes, until the frangipane is puffed, golden brown, and firm to the touch. Cool the tart on a wire rack.